It took more than three weeks into the new fiscal year — a long delay after the date in June that colleges normally send their fall students their final financial aid packages — but we finally know how much the Ohio College Opportunity Grant, the state’s need-based aid program, will offer each eligible student in the coming academic year. The grants for students attending Ohio independent, nonprofit colleges will go down nearly 9 percent compared to last year. A full-time eligible student — an Ohio resident whose estimated family contribution is $2,190 or less — will receive a grant of $2,080, compared to last year’s $2,280. Part-time students will get proportionately reduced grants, depending on whether they are enrolled at least three-quarters time, half time, or one-quarter time. 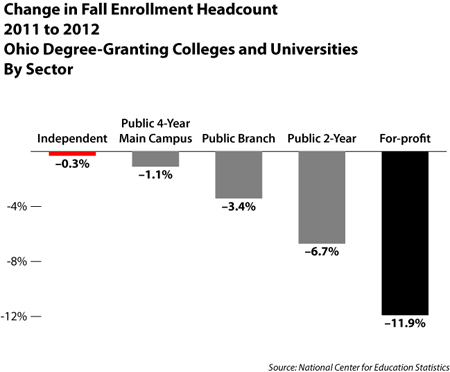 The appropriation for independent-college students stayed the same, at $41 million, but the award level went down for two reasons. First, the Board of Regents, which administers the program, had to spend a lapse of $2.6 million from previous years that would have expired on June 30, when the last fiscal year ended. So, instead of having $43.6 million to spend on students at nonprofits, the program has just the earmarked $41 million. Also, the Regents projected that the number of OCOG-eligible students attending independent colleges would be increasing. Less money and more students means smaller awards. For the two other higher education sectors, the awards will go up: for students at public universities, the award increases 7 1/2 percent, with a full-time student’s grant going from $856 to $920; for those attending for-profit colleges, the award increased 44 percent but from a smaller base, from $460 to $664. Both sectors received increased earmarks from the legislature, and the Regents projected decreases in eligible students in both, consistent with last year’s pattern that showed roughly flat enrollment in independents but considerable drops in the other two. This delayed calculation of awards — the appropriation amounts never changed from the governor’s Executive Budget proposal in the winter, except for a small increase for the for-profits — did not serve students well, as was evident from a July 25 Columbus Dispatch article. 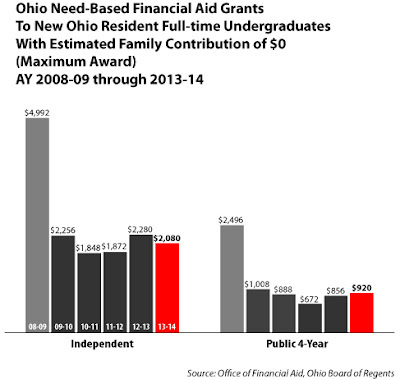 OCOG and its predecessor program had award levels established in statute until it was changed as a cost-saving measure in the 2009-10 academic year, in a failed effort to protect a non-need-based tuition freeze at public campuses. It is time for re-reform.